Summer has come to pay us a visit in the Western Cape. It is the middle of winter and yet we are walking around wearing t-shirts and shorts (well, some of us are). I have used this beautiful warmth to bath the dogs outside. I am catching as much Vitamin D as possible. My garden has not cottoned on to this and finally the herbs are dying away. My sugar bush is all but a stalk in the ground and my tarragon is at the end of its summer bounty. My lavender however is the most amazing purple colour and I have started picking the flowers to add to some salt for Christmas presents. The nights are not echoing the summer days, they are cold and the grass is full of dew. Wet puppy paw prints follow me around the kitchen. Molly is so little her entire body is catching the dew. Warm comforting food is on the menu, and this meal made in summer would be welcome right now. See here for my gravadlax recipe. Wow, Tandy – I can’t believe I missed all of these posts of yours!! You have been on a roll!! Your “hint of summer” is very welcome around here where it is truly summer. Thanks for sharing such a tasty dish with Presto Pasta Nights. And lucky me that my daughter’s garden has tons of dill! It’s weird, isn’t it being in different parts of the world – you must have a different variety of lavender as ours is definitely finished here (when it hasn’t been cut for essence) by autumn. The broad beans are from summer (as well as the post) but I have not had time to write blog posts so my seasons are a bit out. 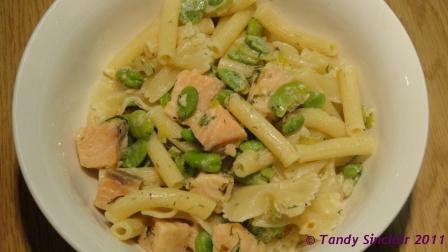 I am hesitant to order salmon and pasta in a restaurant as the salmon is always over cooked. My lavender came up again when the weather turned warm, but sadly the south easter blew it all away. I had not yet harvested the lovely purple flowers so I erally lucked out! Molly sounds gorgoues – we need a pic! I have a few broad beans tucked away still in my freezer, so if I can find gravalax (or maybe I´ll just use salmon) I´ll give this a go! Poor little Molly – it’s the same here with our kitties – poor things must get so cold. Your pasta looks lovely – not sure I could hold back to 2 tablespoons of crème fraîche though. Where do you get broad beans, I can’t find them anywhere? Please post a pic of Molly, I am dying to see her!